Saturday I had the best long run of my life. I ran 20.04 miles in 1:57:29 which comes to a 5:52 pace average. That is great! However, there is a certain relaxation, or subdued pleasure in the training this time around versus the last two marathon cycles I had. The first marathon cycle went well. I was pretty inexperienced so I tailored my training around the goal of making sure that I could finish it. I had a 30 mile run. I also did not really understand the concept of pace variation workouts or of marathon specific pace. I ran a 16 mile simulator, like the Hansons do, and a few other longer 10-14 mile tempos, but otherwise I ran a bunch of 4-6 mile tempos. In other words, I was running longer tempos at 5:58 pace and shorter tempos at 5:29 pace. While that is great, and did help me get in shape, what does a five mile tempo at that pace have to do with the marathon? Along those lines nearly all of my long runs were slower than 7 minute pace. I did not have the 20+ mile run experience then I do now, still what does 7 minute pace have to do with racing at 5:4X pace? Very little that is what. My second marathon cycle went much better. October 2011 might be my best month of training. That being said my race was December 4th, and I only had maybe two good workouts in all of November. I was past my peak. In that particular cycle I was training frequently with M, a 2:26 marathoner and 14:29 5k guy, so my long runs really stepped up a notch. I had a much better grasp of pace variation and marathon specific pace workouts. We were doing workouts twice during the week and a hard long run on the weekend, in addition to our recovery days being at 6:30s and 6:40s paces. It was really good training, it was just too much and in November my body rebelled. Now in my third and current marathon cycle, I'm nailing it. Okay, I'm probably not doing the exact specific paces in workouts that I would like, but let me give a specific example. Instead of doing a 16 mile tempo at 5:48 pace, a 19.5 mile run at 7:36 pace and a 10k tempo at 5:43 pace like my first cycle, I'm doing a 20 mile run at 5:52 pace with pace variation (4x1 mile in 5:35, 1 mile in 5:50). In other words, I'm rolling several workouts into one that is more specific, longer, and involves changing pace (which is difficult when one is tired). I am aided that I have not trained for a marathon in 22 months due to going back to the track and setting personal records at 800 m, 1 mile, 5000 m, and 10,000 m so I have more experience running faster races. Additionally, I have quite a few (20-30) 20+ mile runs from 2012 and 2013 at under 7 minutes per mile pace to give me the experience of longer runs. The downside of this great training is that it seems to be just what I expected. In other words, when I ran 1:59 for 20 miles in October 2011 I was on cloud nine. I did not know if I could go under 2:00 for 20 miles. When I ran 1:57 for 20 miles yesterday, with pace variation, it was less exciting because I was pretty sure that I would do it. It is less exciting despite the fact that I closed the last five miles of my run yesterday in 28:19 compared to 29:04 two years ago. That's a big difference. I'm not being blunt enough, this cycle isn't as fun or exciting as it used to be, at least not in the same way it used to be fun and exciting. It's different, more professional, more serious. Part of that is getting older. 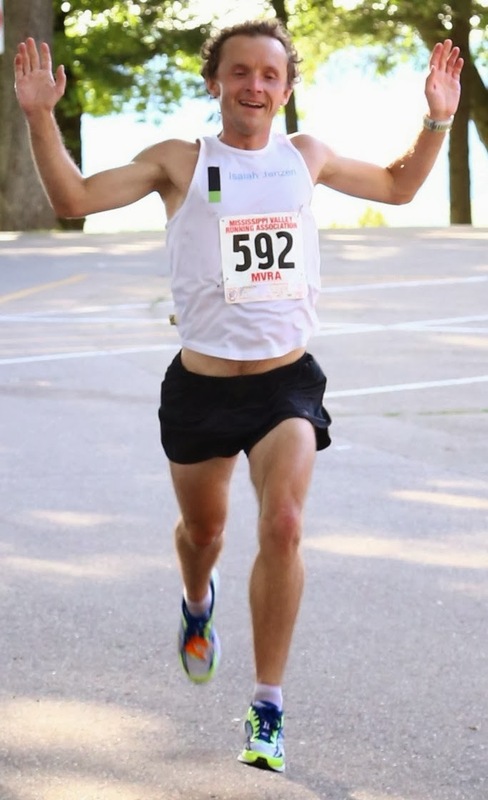 The first time I broke five minutes for one mile I was elated, now I do that on crushed limestone in the middle of a relaxed 14 miler and it is no big deal. Part of that is experience, I can no longer go set overall personal records in practice like I used to. I'm not going to run a 1:52 20 miler alone on a dirt trail. So the expectation is greater because I know what I have done before and getting closer to a race like performance in practice is the goal. The positive side is I am not taking any of this for granted. In the last month I have won a half marathon by nearly 10 minutes and proceeded to run a 10k tempo in the afternoon for my best special block, run my best workout and my best long run. The goal of course is to be a little better every cycle than the one before, but when continued improvement still happens at age 27, you appreciate it more than at age 19. I am so richly blessed! I don't have any plans to stop this athletic experiment, but as I get older I realize that eventually, my best long run and workout will be that for the rest of my life. We have 21 days until the Chicago Marathon. My biggest workouts are done, and all have gone wonderfully! Now it is time to stay healthy, rest up and continue to thank God for this wonderful training experience. I am so blessed.